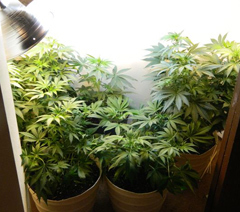 Marijuana plants recovered in search of Fayette apartment. Authorities in northeast Iowa are still looking for two young men after a marijuana grow operation was discovered Christmas morning. The Fayette County Sheriff’s office executed a search warrant at an apartment complex in the town of Fayette after receiving a tip about marijuana being manufactured in one of the units. Around 2:30 Christmas morning, deputies entered the apartment at 106 Mechanic Street and found “numerous” plants, equipment, chemicals and heat lamps. 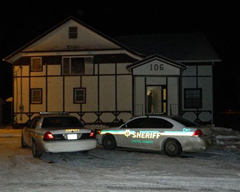 Two men are wanted on charges of manufacturing marijuana. They’re identified as 25-year-old Jerek Bowe and 21-year-old Duke Ewan, both of Fayette. A release from the Fayette County Sheriff’s office, issued this morning, indicates the agency’s drug dog was instrumental in the department’s effort to obtain the search warrant. The Iowa State Patrol assisted with the investigation. Photos courtesy of the Fayette County Sheriff’s office.